As visitors come into the Town of Dryden, they are greeted by signs. Most say “Town of Dryden”. Some have an additional “Right to Farm” sign and others add “Since 1797”. One sign is different, and has been for a year now. 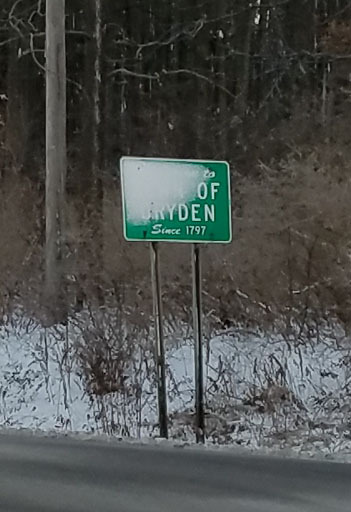 When you approach Dryden from the Town of Ithaca on Route 366, the Town of Dryden sign is missing. In its place, someone put a sign for Perchn.com, the student housing website. Sign on Route 366, Varna (Perch'n). While I would like the Town to fix that, it is unfortunately an accurate portrayal of the Town’s attitude toward Varna. The Town Board, despite past claims of award-winning planning, doesn’t protect Varna. Remember those “We [heart] Varna” stickers of a decade ago, when the Town was trying to convince hamlet residents it cared about their input? Lately, the Town seems eager to shred those plans. The escape hatches – Planned Unit Development, Special Use Permit, unexpected state bridge grant with bizarre limitations – are open and the Town is rebuilding Varna for maximum property taxes, and placing zero value on community. Huge privatized dormitories make money faster, and their residents need to be able to get everywhere quickly. They won’t, of course, generate any traffic, but we should definitely rebuild the roads for those rare moments when they want to go to the mall. Making this even uglier is the slowdown in student housing demand. Cornell finally recognized that adding thousands of students without adding their own housing creates some gaps in the student experience, not to mention creating a bubble in local housing prices. I have a hard time imagining this dormitory thriving, given its distance from most of Cornell and its completely student-centric design. Varna has done well with vet students, but there aren’t that many of them. One thing that could be worse for the neighborhood than Trinitas succeeding would be Trinitas building this and failing. Varna is not, of course, the only part of Town to feel burned by the Board’s fondness for big projects, but we seem to be getting the heftiest dose of them. Slow down, and listen to the neighborhood instead of developer dreams. Fix the sign when you remember that Varna is something more than the Collegetown East colony of Dryden. The Right to Farm sign is a recent addition. The Perch'n sign has been there since at least January, when I took a picture, but I think months before that. Looking at the initial results for Tompkins County's Democratic primary, the big surprise to me is in the last race. Emily Adams won the Member of State Committee 125th Assembly District (Female) race by 62-38 over Diane Bruns. There were almost no signs for that race, no advertising that I saw, though not being a registered Democrat, it's completely possible it skipped me. I had a few conversations with active Democrats asking what that race even meant. I suspect that a lot of voters just guessed (and 2771 of 10,634 didn't vote that line) but that result is far far away from 50-50 statistical noise. I know and like both Emily (from the Sanders campaign) and Diane Bruns (from her work with the Dryden and Tompkins County Democrats). Had I stayed with the Democrats, I would have voted for Emily because I think she's more likely to push for much-needed change at the state committee, and connected to others to help with that - but wow that's going to be a thankless and difficult job. Years ago, within the county committee, a pair of candidates tried to take the two County Committee seats from the party regulars to promote change at the state level. The incumbents argued - plausibly - that they were doing as much as was possible or effective to create change, and it just wasn't possible to accomplish more. We'll see what happens. Good luck, Emily Adams! If I was Andrew Cuomo - and I'm definitely not - I'd be delighted this morning. Not only did he win, but the counties that dared vote against him are fewer in number. Still Upstate, mostly concentrated in the Capital Region, plus reliably treasonous Tompkins. Cuomo's preferred Attorney General candidate, Letitia James, won. She seems less likely to rattle his donors than Zephyr Teachout, and I think he can plausibly claim that his party machinery was crucial to her success. I've seen a few folks suggest that Cuomo is likely sad about the defeat of most of the Independent Democratic Conference senators. I don't think he is. The IDC was a splendid tool for him, a way to maintain the divisions among Democratic Senators that let him hide from issues that might rattle his donor base. However, Cuomo managed to reunite the Democrats formally before the primaries, and the demolition of the IDC was largely under the banner of "party unity". Since Cuomo is likely to have a Democratic Senate this time anyway, and since he controls (most of) the party, "party unity" probably puts him in a more powerful position than he would have been otherwise. The IDC sacrifice seems likely a good thing for him in the long run, and he can now more easily use party unity as a reliable club against the left. Clearly, it's great to be Cuomo. It's much riskier to be the folks who let Cuomo be Cuomo, whether they're the IDC Senators or the staff people who got indicted and convicted of corruption charges that clearly had nothing to do with the Governor. You really shouldn't pay close enough attention to notice that. It's not very often that I get to say that history has been kind to Varna. The highway slashing through it has damaged it for decades. The community's willingness years ago to build water and sewer infrastructure has made it the dumping ground for the Town's dreams of density and tax revenue. "So far from God, so close to Cornell," or something. However, history did us one massive favor. The historic Freese Road bridge is both an emblem of local industry and the most effective traffic calming device in the area. The intersection of Freese Road, Mount Pleasant Road, and Dryden Road has some of the worst sightlines in the area, combined with steep hills that make winter driving exciting. We know that the Town Board wants to see lots and lots of development in Varna. Why would you want to draw even more traffic to the area than it already has, to an intersection that’s broken and unlikely to get better? History's been protecting us here. Be kind to history. Don't sell us out and claim the state made you do it. If it comes down to it, don't take state money to make your Town worse. Posted by simon at 7:23 AM. Wow. I hadn't been to a Town Board meeting in over a year, and Thursday night I returned somehow to a meeting that left me wondering if a former pillar of the Town's economy has completely and utterly lost contact with the place and maybe with a lot more. 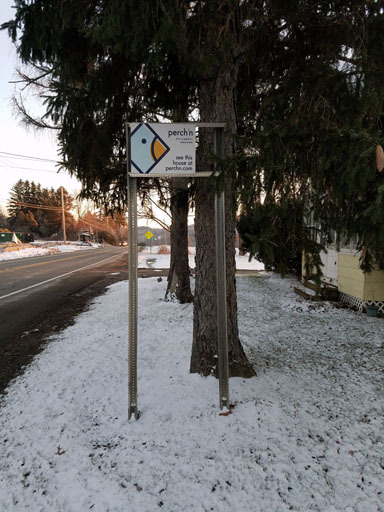 NYSEG wants to build a gas line from the Village of Freeville to Lansing, along Route 38 and West Dryden and Farrell Roads. This is a pretty good summary from last summer of the proposal. NYSEG seems to call it the Lansing-Freeville Reinforcement Project. It's a 10" steel pipe that structurally could carry about 20 times the amount of gas they want to regulate it for. NYSEG has let the pressure in their local network drift down to below 50% of maximum pressure. They like to run at about 70%. A little less than half of this line's capacity will bring that pressure up to above 70%, and rest allows expansion. The line might bring some residents on West Dryden road natural gas service, but only those who live within 100 feet will get a free installation. Pays property owners a generous $1 for letting the line go through. Is for transmission or distribution - and NYSEG acknowledged that they could run a larger pipe through the same space. Leaves liability with property owners. Is kinda sorta negotiable, though apparently not on the parts that actually bother people. NYSEG would rather not say anything about any details on that front ever. I don't think NYSEG helped themselves much at the Town Board meeting. NYSEG/Iberdrola's Dryden brain - hint: the management building is empty..
Next up was NYSEG - Community Relations Manager Bob Pass, Project Manager Dave Bovee, and Jennifer Negus from their Real Estate division. NYSEG presented to the board, not the public, though members of the crowd (70 or so?) expressed their opinions periodically, and the board called up Tony Ingraffea near the end of the session to answer some questions about NYSEG's answers. Bob Pass handed out a sheet with "Information on how we design, install, operate, and Maintain Natural Gas Systems". It had a link to http://www.dos.ny.gov/info/nycrr.html, with directions to view the unofficial NYCRR, and track down Title 16, Chapter III, Subchapter C, Part 255. Following the directions takes you to here, which isn't especially readable. The board was, um, deeply unsympathetic, with Linda Lavine reminding her that "God didn't write that template" and suggesting repeatedly that NYSEG might get further in these negotiations if they didn't start from the extreme position they seem to take for granted. Residents and the board challenged NYSEG's negotiating tactics, but got pretty much no useful response. Dave Bovee did a much better job answering questions, sharing facts even when they made Bob Pass grimace. His data about the pipeline - run through Tony Ingraffea, who the board had speak briefly during the NYSEG presentation - yielded the information above. He offered details about the pipes, the connection to Dominion's pipeline in the Village of Freeville, and how the system would respond overall. My one doubt about Bovee's testimony is his faith that line pressure limits, once set, will never change. Yes, there are physical and government regulators involved, but both of those can change over time. While yes, it would cost money to change the physical regulators, and it might cost money to change the government regulators, neither is genuinely etched in stone. This pipeline, if built, should be around for a long long time, and given how overbuilt it is, it's not as hard for me to imagine regulators eventually allowing higher pressure in it than it is for Bovee to imagine the same. After almost everyone had left, the Board explored its legal options and asked Town Attorney Mahlon Perkins and Code Enforcement Officer David Sprout to prepare opinions based on the zoning and franchise agreement. I hope NYSEG listened enough to recognize that their current strategy isn't working very well. Their approach and choices have made many residents skeptical or hostile in a town that's already defeated the gas industry once. I fear that they will change their strategy to eminent domain, which they acknowledged was possible, rather than listening and adjusting. You can see the Ithaca Journal's report on the meeting or WHCU's report. Might Assemblywoman Lifton be vulnerable to a 2016 primary? Should staff allocation information be distributed openly? How can members have a greater opportunity to weigh in on policy and budget decisions before legislative negotiations? How can we encourage a real and robust debate in committee meetings and on the floor? Should Members have the ability to get bills voted on in committee and on the floor if there is broad support among colleagues? Barbara Lifton's name is not on the letter. Perhaps she will sign on later? Lifton's district, though, pretty much screamed reform in September, when Zephyr Teachout thrashed Governor Cuomo 3464-1415 in Tompkins County, the bulk of her district, and 444-304 in Cortland County, of which Lifton represent a part. To put it another way, Teachout got more votes in a Governor's race with low turnout than Lifton got in Tompkins County in the 2002 primary that began her legislative career: 3340. Lifton's total for both counties is higher, but I don't have town data to compare for Cortland. However, her margins in Cortland County have been reliably lower than those in Tompkins County, and numbers this close are not comforting in any event. The other complicating factor is that Sheldon Silver's campaign committees stood as a bastion against reform challengers, able to send out money to help those Silver thought would help him. It's not clear what will happen to those committees and their funds at this point. State Democratic primaries haven't brought a lot of voters to the polls for a long time. Perhaps, given real choices, they might again someday. Perhaps this will all be forgotten by 2016. Or perhaps it won't. Update: More on the reform caucus here, and we may get to have similar conversations about Senate Republicans soon. 12:30 p.m.: [DOH Commissioner] Zucker says he wouldn't live in a community that allows fracking. Local politics can make a huge difference, even in - perhaps especially in - battles that seemed hopeless. 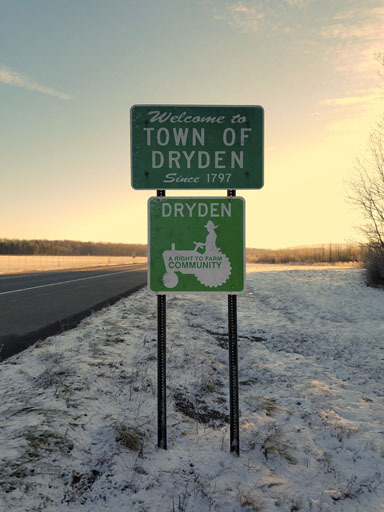 The Town of Dryden's passing a drilling ban and persevering in its defense wasn't the only thing that led to today's decision, but it was a critical component of the story. The Varna Community Association will be putting on a free Thanksgiving dinner this Thursday, November 27th from noon to 3:00pm at the Varna Community Center, 943 Dryden Road (Route 366). Come enjoy the turkey and much more! Thanks also to the Town of Dryden for supporting this with a grant. 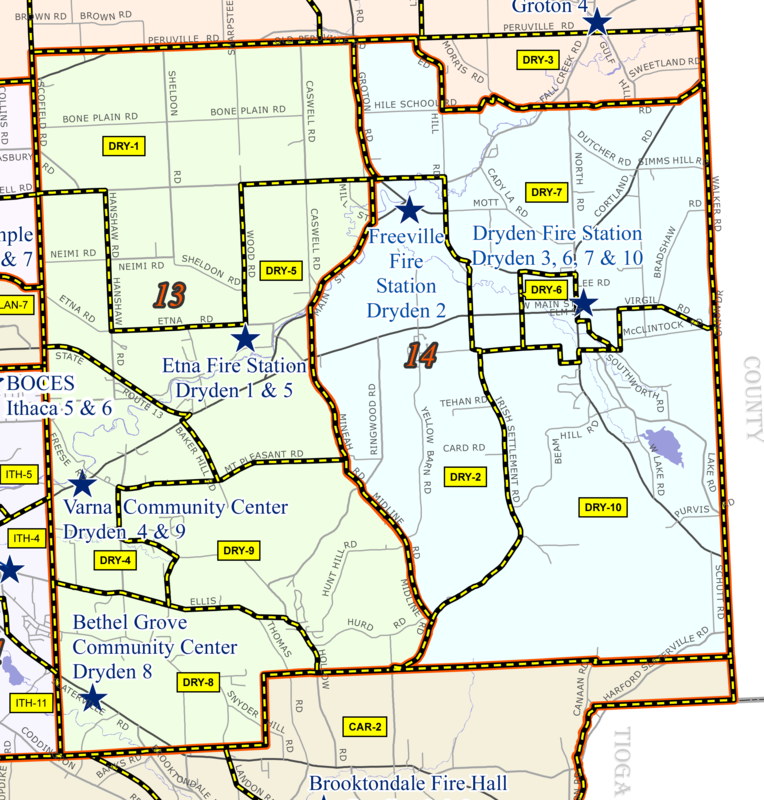 Polls will be open in Dryden today from 6:00am to 9:00pm. 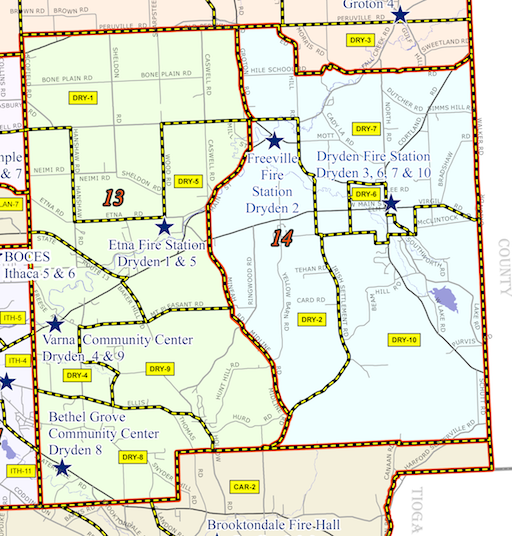 Current election district boundaries in the Town of Dryden. If you'd like to see a sample ballot before going in, the Board of Elections has them. Want to make up your own mind? Here's the debate. This is one of the easiest endorsements I've ever made. Martha Robertson has impressed me since she first came to my door to ask for my vote in her first run for County Legislature. We don't always agree, but when I ask questions she either has a thought-out answer or takes the time to find one. I'm jealous of her energy. She's about the hardest worker I've encountered in politics. She reaches out on a regular basis, she takes advice well, and she's good at finding common points among people from very different backgrounds. I hadn't realized she was a kindergarten teacher, which I take to be a good thing. She's learned lessons from that but doesn't talk to people like they're five. She's been able to tell the difference between her own views and those of the people of her district a number of times, and built bridges the people in her district and the people inside government. That's been especially helpful on Varna-related issues, but I've also found it important on highway issues and the lightning rod of fracking. She's worked with every level of government, from town through county to state and federal. She's worked with Republicans, including Chemung County Republicans, through the Association of Counties, and fought together with them to make Albany take a saner approach to Medicaid. I knew Tom Reed growing up, and nothing he's ever done has made me think he should be a Congressman. We share a hometown of Corning, but little else. His politics irritate me, and his campaign strikes wrong note after wrong note. His constant contempt for Tompkins County, where I now live, makes me embarrassed that we share a hometown. As much as I talk about Upstate New York, my heart is in the Southern Tier and the Finger Lakes. Robertson will make sure we still have a Southern Tier and a Finger Lakes to love, with jobs that last longer than a gas boom and at less risk of being exported. It's an easy choice for me. I finally saw a Cuomo sign this weekend, in Freeville. Someone is cheering for the Governor, but finding strong Cuomo fans is surprisingly difficult. Cuomo (Working Families Party) - GOP-lite but desperately hoping that he'll be nice or something and that the Working Families Party will get the 50,000 votes they need to keep their ballot line despite endorsing someone out to destroy them. Hawkins (G) - Wow! Someone with ideas about how New York should be different! McDermott (Libertarian) - Well, I can't see libertarians voting for anyone else here. Cohn (Sapient Party) - Their principles are an odd mix of "sounds great" and "what does that mean?" I'm happy to support Howie Hawkins. As a Syracuse resident, he'd break the curse of Nathan Miller, our last Governor from Upstate (1921-22). He's a Teamsters member loading trucks for UPS, and he would push New York away from the continuing capture by New York City financial and real estate interests that is drowning our politics in empty advertising. There's a lot more in this introduction. Isn't a vote for Hawkins a protest vote? Isn't Cuomo guaranteed to win? Does it matter? I don't mind lost causes at all, though. Sometimes they're the best causes. And sometimes they even yield pleasant surprises, especially in the long run. Another year, another set of constitutional amendments on the New York State ballot. We don't go as far as some states, but occasionally it gets interesting. This year's Proposal 1 is the "fake independent redistricting reform" option. It's basically the same terrible broken system we have today with a little bit of window-dressing and a fallback to the usual corruption. Please vote against it. Or listen to Kathy Zahler or Mike Lane's gentler tellings. Proposal 2 makes me sad, because the temperature of the freshly-copied legal papers hitting legislators' desks combined with the lateness of their arrival is a historically important indicator of how broken last-minute legislation will be. I'll probably vote no, but Kathy Zahler's take on why to vote yes is a saner approach. Proposal 3 is also a bad idea. Technology is magical, and needs no maintenance right? So let's go into debt and it'll all be fine even if the debts last longer than the tools. Er, no. Again, Kathy Zahler has the right idea. I'll be giving an expanded version of my talk on the Battle of Queenston Heights at the History Center in downtown Ithaca, on Saturday, November 8th from 3:00pm to 5:00pm. 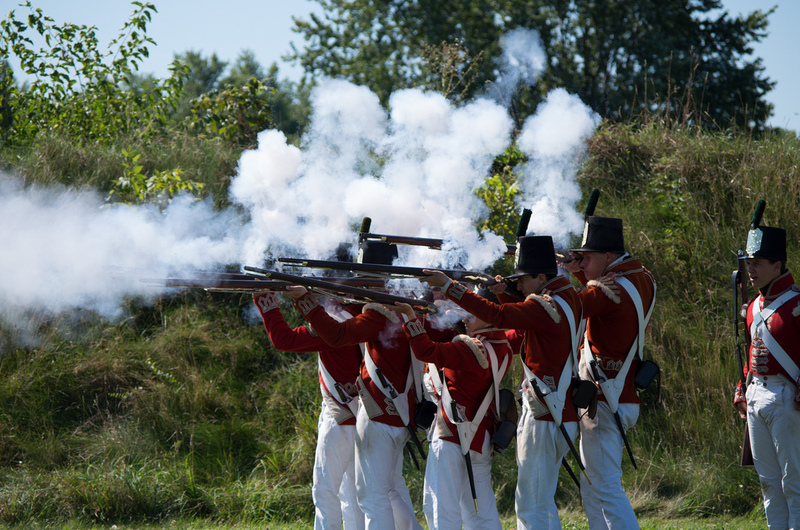 Death, Hell, Or Canada: Dryden and the War of 1812. This time around, I have more information about soldiers from elsewhere in Tompkins County, notably Lansing and Trumansburg, thanks to Carol Kammen and a few town historians. I have more about the comparisons between the armies, and I'll be including more about the Canadian perspective on the battle. I started from this chapter in George Goodrich's Centennial History of Dryden, which made clear that Dryden militia had fought at the Battle of Queenston Heights, and been killed (one), injured (at least one), or captured (everyone who crossed). I'll talk about the many ways in which war was different then, and focus on the challenges of a largely militia attack across the Niagara River. Redcoats firing a musket volley. 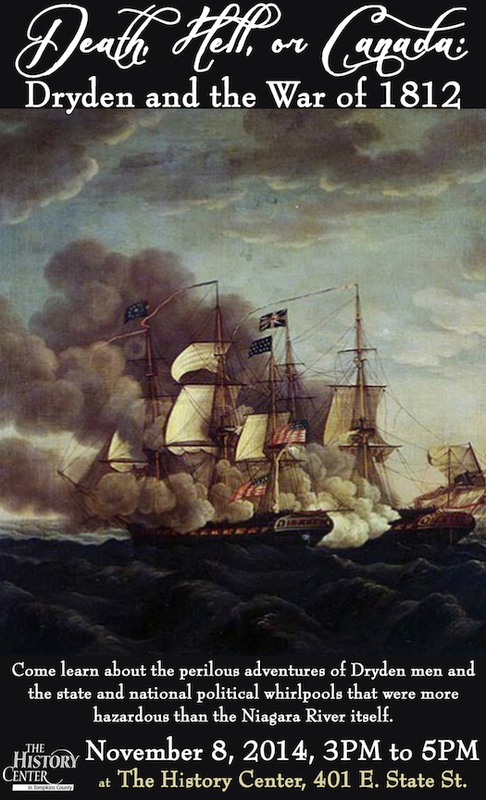 Somehow, most Americans have forgotten about the War of 1812. Canadians seem to have put a lot more effort into remembering. 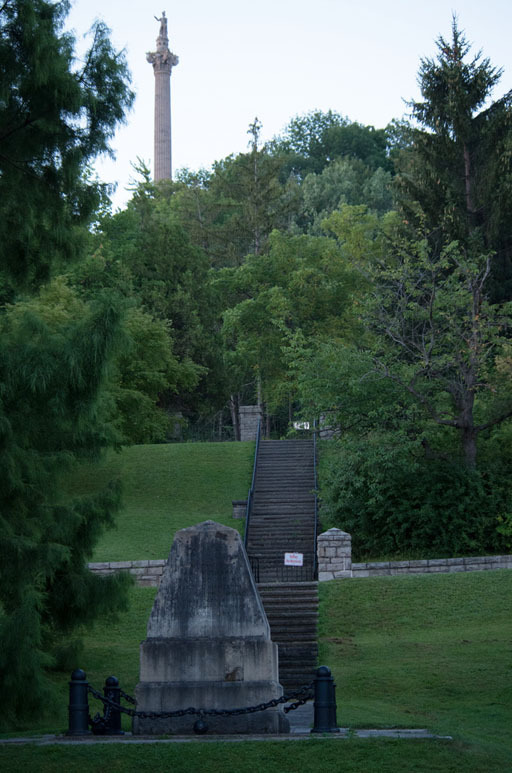 Cenotaph and monument for the fallen General Brock. Obviously, I won't be showing all of those pictures! Hilary Lambert on Who pays for heavy road use? This feature will be disappearing soon.